I have been working on the recycled rug a lot the last few days. I have used up all the denim I had made into reels. I have another box of old jeans that I had been storing in my attic 'till I figured out what to do with them, so now I will cut them up and add them to this rug. As of right now, the rug is two feet by seven feet. I hope to get it to four and half feet by nine and half feet. That will make a nice little rug for a kids room or play room. I have been asked what does my needle look like and what size thread do I use. The blue sewing thread in the picture is to stitch the denim together. ;linen six-ply cord white/cream is in the middle of the picture, and that is one of my needles. I have a larger one; I just can't find it right now. The linen and big needle are used to stitch the braids to the rug. That is one serious needle! 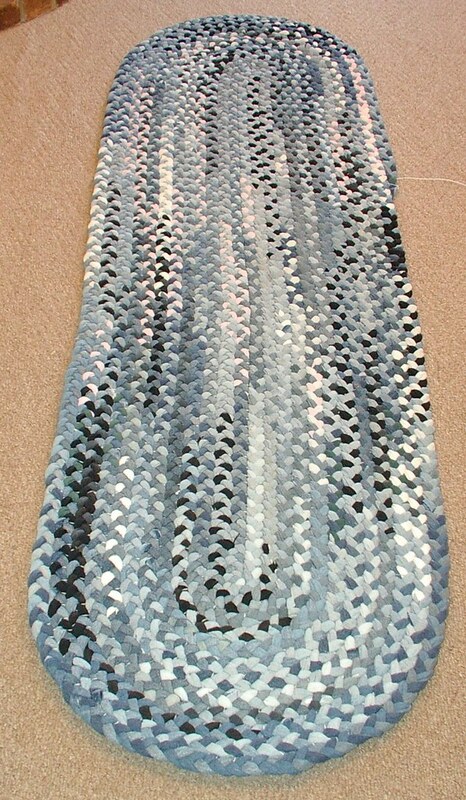 I've always wanted to try braided rugs; you might have given me the boost to do it! Your rug is very nice. What a great idea for the play room!